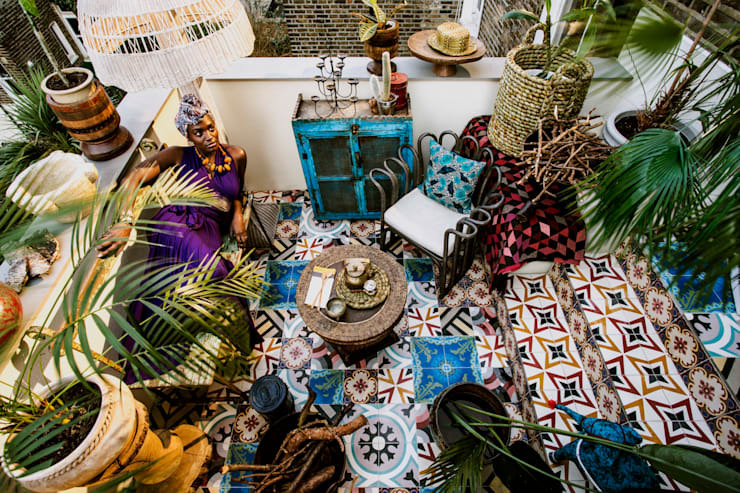 Peponi House (Peponi – a Kiswahili word meaning paradise, ideal or idyllic place), is a three storey Victorian conversion in Notting Hill London and is an inspirational journey that takes the occupant on a vast and colourful adventure. Designed by the astute team at Studio [D] Tale, this dwelling’s refurbishment was commissioned by a private Kenyan client who wished to evoke memories of Africa, along with a ‘home away from home’ aesthetic. To quote the architect, ‘The over riding vision was to create a physical expression of a 'Wish You Were Here' postcard greeting for each room as a response to the brief.' This is highly evocative throughout the home, witnessed by the rich textures, eclectic materials, and predominant cultural nuances. 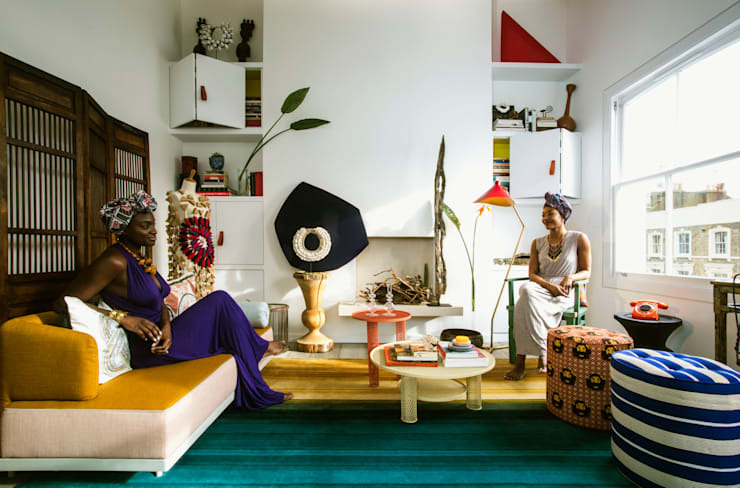 To ensure the refurbished dwelling reflected its owner, the architects and designers worked closely with their client, learning the ins and outs of African travel, and specific experiences related to the identity of person and place. Practically, the 100 square metre house underwent many structural changes. With a budget of £150,000, drastic alterations were embarked upon to improve the cohesion and sense of movement throughout the abode. Roof lights were installed in many of the domestic spaces, bringing lightness and a natural illumination into the dwelling. The floorplan was opened up with demolition to part of the original structure. This allowed picturesque and sweeping views to be released and exploited, enhancing the interior of the home. One of the most spectacular features of the refreshed residence is the three storey high feature wall that showcases a custom cantilevered steel frame staircase and gallery space. Outside, the structure forms a green ‘living wall’, adding to the abundant sense of nature. Finally, sustainable materials were employed where possible, opting for a reduction in the carbon footprint. This gorgeously renewed house features ethically sourced cultural homewares and furniture, seamlessly contributing to the overall sense of serenity. If you would like to take a peek inside this dwelling, check out the images below, and gain a little inspiration for your abode today! As one of the main rooms within this Victorian home, it is the largest and most spectacular. The original ceiling has been opened up to create four metre tall wall spaces, exuding spaciousness and an airy vibe. At the back of the image we see the bespoke joinery, which houses the fireplace and creates an ideal centre piece for the room. The fireplace not only works as a stunning feature for the home, but provides a central gathering point, and area for friends and loved ones to assemble and share a sense of community and warmth. Joto is the Swahili noun for heat, and this perfectly epitomises everything this room aims to achieve. The colour scheme and design of the space is maximalist in its approach. Boasting bright hues, and fabulously contrasting colours, the room is a feast for the eyes and the soul. Artwork is employed within the space to impart culture and an aesthetic sensibility, while the overall feeling is one of comfort and sophistication. The timber stairs are a standout feature within this home. Clad in naturally stained oak, the earthiness of the wood grain resonates within the abode. 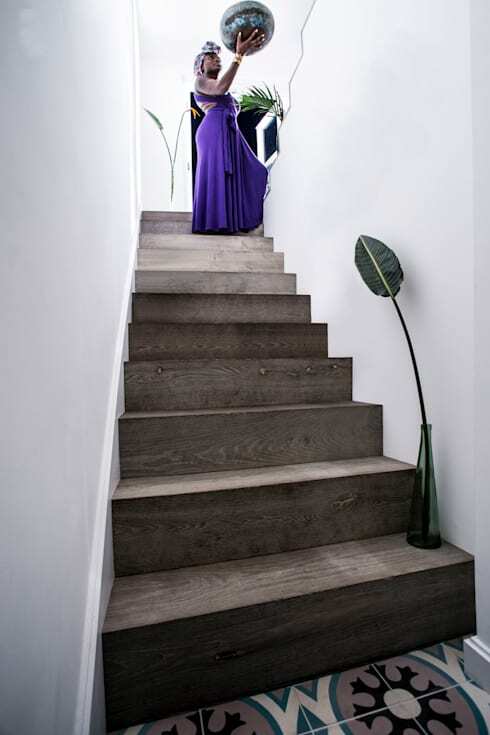 Wire brush flooring is utilised to accentuate the wood grain while walking with bare feet, ensuring the occupant not only sees, but feels a connection with the design and construction of the home. 'Chombo', the Swahili noun for vessel is evocative of the essence of the space. This pathway creates a portal into different living areas, but it in itself is a piece of important and eye-catching furniture. The Swahili verb, kupika, means 'to cook' and inspires the beautiful bespoke kitchen space in this image. The first thing we notice when entering the room is the gorgeous blue toughened glass shelving. This feature provides a whimsicality to the space, while evoking a sense of the sea and ocean. 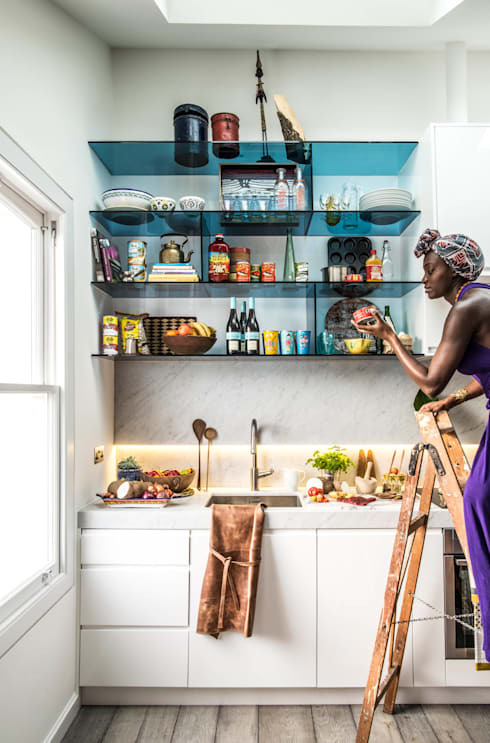 Within these shelves we see a range of ingredients and utensils essential for Swahili cooking, gorgeously displayed to add colour, and a sense of liveability within the room. However, this is no normal kitchen space, lavish additional materials have been included to create a luxurious sense of style. Carrara marble is utilised as both the splashback and worktop, with custom made and designed joinery in a sleek high gloss white finish. When living in such a busy and bustling city, rarely do we get the opportunity to feel connected to the outside world, and at one with nature. This bathroom has been designed to combat that feeling. 'Mvua' is the Swahili noun for rain, perfectly encapsulates the essence of this wet room. As an indoor/outdoor space, the bathroom is located at the highest point of the structure, essentially offering it a treehouse-like quality. As it is removed from the main living areas, the space is tranquil and serene. 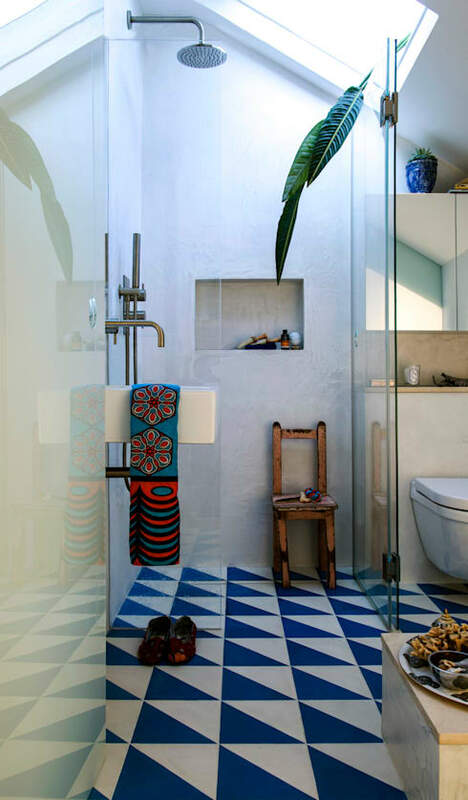 The colour scheme is neutral, with bright geometric blue tiles for the floor. This colour helps to enliven the space, and works in conjunction with the antique chair and bright textiles. The terrace is evocative of lively locations around the globe. Handmade cement pigment tiles were imported from Africa to add a dramatic splash of colour within the maximalist space. Geometry features heavily within this outdoor area, with different shapes and forms opposing and contrasting each other. The key Swahili word used to evoke a sense of ambience in this space is 'maji', translated as the word for water. Woven mats and antique furniture revives the essence of nature and invites the occupant to feel a sense of connectedness with culture and the external environment. As we come to the last room of the house, we are greeted by a gorgeously tranquil and welcoming room. The ambience is restful and inviting, with a sense of tropical calmness that is achieved through various design techniques. 'Nuru' means light in Swahili, and this has been used to evoke a certain aesthetic throughout the space. Above the bed sits a large automated skylight, allowing the early morning rays to gently drift and filter into the room. 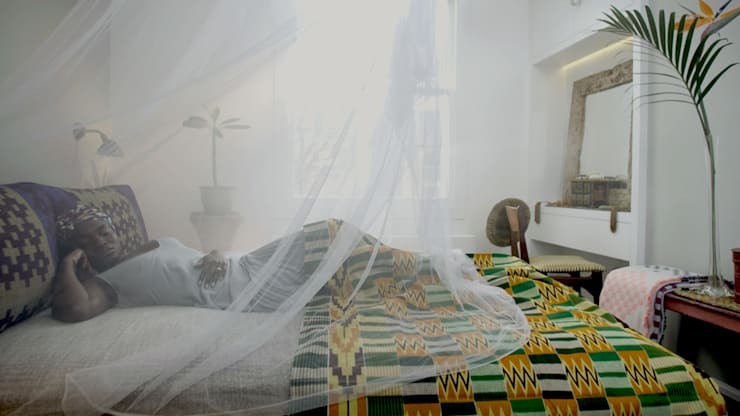 A mosquito net is utilised to enhance this light, while providing the feeling of being in a faraway land. The striking quilt by Hay is a gorgeous inclusion, adding colour and life to the subtle and serene space.